So you want to mod your Xbox 360? This is a custom Xbox 360 that I modified myself last year and still never had any red Rings and never been banned from Xbox Live. So if you want to know how I make creations like this, the rest of this site will help you through the process of building a better more custom Xbox 360. 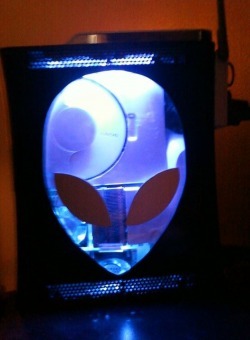 Thinking of modding your Xbox 360? Before you start modding your xbox there are a few things you should know. Modding an Xbox will void your warranty with Micosoft so I would Highly suggest not modding it unless your warranty is up. The only reason I say this is because you payed for a warranty so you might as well get the most out of it. On a final note these tutorials are here to help you, however if you are to mess up or damage your Xbox 360 in any way I can not be held responsible. Now with that out of the way lets get on to opening your Xbox 360. You are going to need a special tool to open the Xbox 360, However the Xbox 360 can be opened with a straightened out small paper clip. Also you will need a Torx 10 security bit screw driver. You can get this from RadioShack if you want to get it right now, they should have a kit with a Torx 10 regulare bit in it, that should open it. Or you can get one off ebay or a small kit like this from Amazon. Follow this tutorial to get you Xbox 360 open. Now that you have your Xbox 360 open there are an endless amount of possibilities. You can go and click on one of the sections at the top left side of the page in which category you would like to pursue. I recommend starting with fans and cooling.